100% Brand New and High Quality，durable material and workmanship to withstand daily wear. Rivets chain and skulls is the element of retro and punk style. and speculative fiction that involves an era or world where steam power is still widely used. Perfect Halloween accessories the steampunk is the prominent element in the Victorian in the 19th century is great for cosplay. 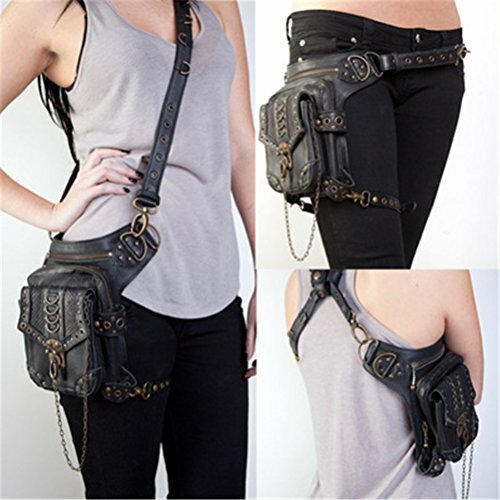 The steampunk bag is from Independent brand XY Fancy focus on steampunk Products, Original Design. Our goal is highlight your unique style and personality,to make your life more wonderful. The length of the tape is 59in, and the other is about 19.7in. Perfect for carnival, theme parties and Halloween's adult high quality imitation leather bag. Creative design bag：Cool accessories you can wear it on shoulder，waist or back. This bag are decoration with rivets chain and skulls made the bag very gorgeous Retro and Punk style. If you have any questions about this product by GEANBAYE, contact us by completing and submitting the form below. If you are looking for a specif part number, please include it with your message.